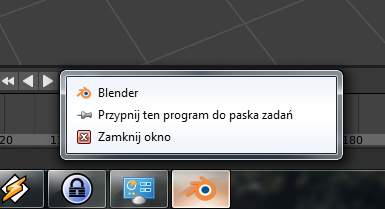 After starting Blender I was able to click Blender icon on taskbar with right mouse button and it showed menu allowing to pin application to taskbar. After downloading newest version today I'm no longer able to pin it. Menu does not show up. Attached screenshot is showing how it worked with previous version I was using. While testing version: 036ec5cae4f7, windows64 on different PC with Windows 10, I'm not experiencing this issue. I will try this specific version in ~10 hours back on PC from which I reported it and if I still have this issue, it means it might be specific to my PC. Therefore bug report is most likely false-positive. I will update with a comment later today. I'm eagerly waiting for what you discover. Initially after going back to PC with windows 7 and newest build checked previously on win10 I had very weird results but after some testing in the end I know how to reproduce it repetitively. However issue seems to be very edge case and it might not be even Blender but some operating system caching. Seems like first time I start Blender after PC is started, it will work fine, but if after that I change location where Blender is located and start it again without reboot, it somehow affects this feature. Seems like OS could cache location of executable somehow and then is getting weird when the same executable is started from different location. Ok, just got an idea to do exactly the same test with different application not installed but unzipped. Exactly the same result, so it's OS issue. false-positive confirmed. Ok, thanks for you thorough testing.